With an update to Snapchat’s Lens Studio, anyone can now create custom augmented reality (AR) face lenses. Previously, Snapchat’s Lens Studio let users create basic location-based lenses, called “World Lenses,” as well as lenses that applied AR effects to the surrounding environment. This is the first time regular users have been able to create custom face lenses for Snapchat. Face Paint: Uses face mapping to apply artistic elements, such as makeup and accessories, to a person’s face. Photo: Import an image and Snapchat’s ‘detect face’ functionality will align it to a face lens. Distort: Stretch, expand, and contort a face in all different directions. Trigger: Interactive lenses that trigger different elements to appear based on moving parts of the face. 2D Objects: Attach 2D illustrations to the head. 3D Objects: Attach 3D objects to the head or face. 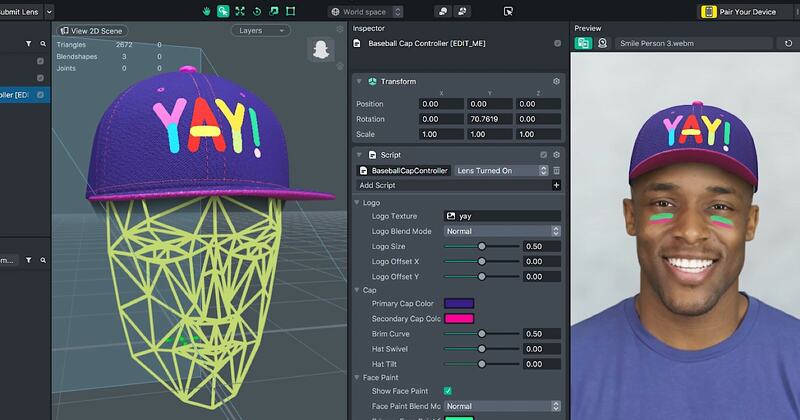 Baseball Cap: Attach a custom designed baseball cap to the head. In addition to these updates, Lens Studio is adding GIPHY integration so users can add animated GIF stickers to both world and face lenses.